"I always say that my real life only started at the Palliative Care Unit of the Royal Victoria Hospital,” says volunteer Jean-Pierre Fournier. "It is here I learned to really live life." 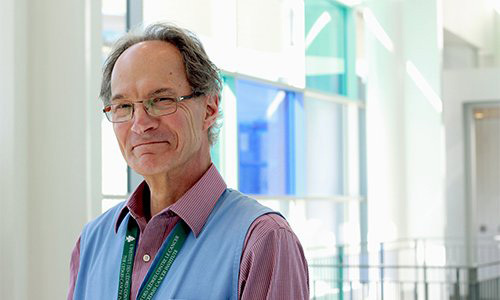 “I always say that my real life only started at the Palliative Care Unit of the Royal Victoria Hospital,” says Jean-Pierre Fournier. “It is here I learned to really live life. Every Tuesday, wearing his traditional blue jacket, 65-year-old Jean-Pierre Fournier arrives at the Palliative Care Unit of the McGill University Health Centre’s Royal Victoria Hospital (RVH-MUHC). He has been a dedicated volunteer of the unit for 13 years. Even though he is an accountant by training, Fournier is no stranger to hospitals. In fact, he was an executive at a long-term-care centre (CHSLD) for close to three decades. For him, a palliative care facility is far more than a healthcare unit; it’s a place where he feels a true community spirit resides. Even closer to home, Fournier was by his sister Louise’s side as she battled brain cancer in 2001. With his professional and personal experience he knew he wanted to help those in their final stages of life. “I truly believe that it is a privilege to be with people during these last steps,” he says. Always smiling, Fournier goes from room to room visiting patients and offering a very personal kind of support. After all these years, the palliative care unit has become familiar territory for this man who does his work with utter humility. Fournier also says that he feels there’s a great deal of life and liveliness in the unit. According to him, patients that find themselves there don’t give off an air of sadness, that people do their best to keep the energy positive.